Continuing in my sharing of the fabric technique cards we made at a recent class using the Stampin’ Up! designer fabrics, and I thought I would post a couple more today. Sure, this is the most basic way to use fabric… but its fun! And while I grew up with a mom who is a fantastic sewer, I never quite go into it and so didn’t internalize some of the basics. So, I was excited to be reminded by Bethani about the fact that when you tear a piece of fabric, it will give you a wonderfully straight edge every time. I’m so used to paper that will has a complete mind of its own when it comes to tearing, so I was thinking I had to use a cutter for every edge. Sure, the tear gives you a slightly feathered look… but it’s a CUTE feathered look. I just LOVE how this turned out! Most of the card is pretty self-explanatory. 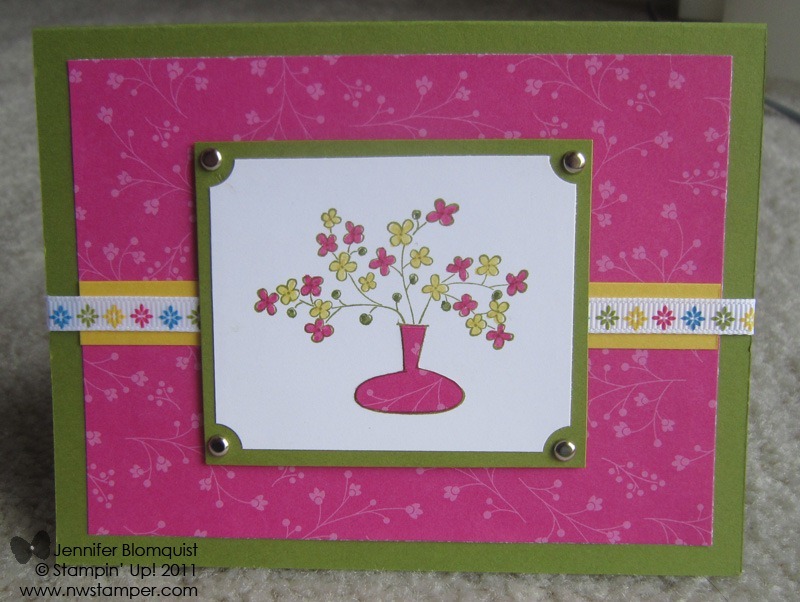 We stamped the flower image on the base cardstock in Versamark, and then did simple sponging and punching for the other elements. And then we get to the fabric flower…SO FUN!! Ok, to make the flower, we cut out 4 flower shapes – in this case using the Cherry Blossom embosslit. Once you have those four flower shapes, take a small square cut from a Sticky Pages sheet. Expose one side of the Sticky Page square and then take one of the fabric flowers and fold it in half. Place that folded flower on half of your sticky square. Next, take your 2nd fabric flower, fold it in half, and place it on the sticky square so that it overlaps the the first fabric flower and now forms an “L” shape. Ok, on to fabric flower 3. You guessed it! Fold it in half! Place it on the sticky square so that it overlaps flower 2 and the folded edge is flush against the folded edge of flower 1. Finally, grab and fold flower 4. Place it on the sticky square so that the folded edge is flush with flower 2, its right corner is on top of flower 3 and its left corner is under the right corner of flower 1. At this point you should have a flower that is stuck to the Sticky Pages square. I then pierced a hole in the center with the paper piercer and placed an antique brad. Then remove the remaining backing on the sticky square and place where you want it! 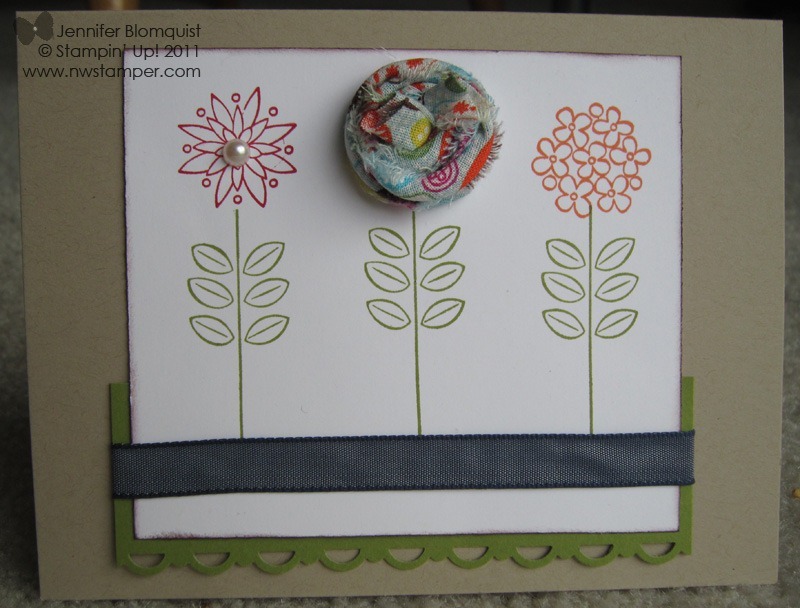 In my card, I layered it on a Rose Red scallop circle that was punched using the 2 3/8” scallop circle. LAST DAY of Sale-a-Bration! Did you get your FREE stamps? How Big Is Your Wish List? There are only 2 days left of Sale-a-Bration! And while this promotion is great for getting all kinds of freebies with every $50 you order, if you are finding your wishlist is a little bit bigger than that or you love the idea of getting a discount on every order you place – its an even better time to see what its like on the other side of the fence as a demonstrator. Did you know that the starter kit has over $310 worth of products and supplies for only $175? But through Thursday you can get it for 15% off PLUS bonus product bundle worth $50. So that means you would get $360 worth of products for $149 and free shipping! And, as a demonstrator you get a number of other benefits and the best part is, you don’t have to be a salesperson to enjoy them! Its true! There is no obligation to sell or purchase anything. So if you are interested in earning extra money each month or just getting a discount on everything you buy, I’d love to have you join my team of demonstrators. We are a fun group who share ideas, support, and friendship across the US. Click for details of this Sale-a-Bration Starter Kit Promotion here! So, here is my story, to which I think a number of you can relate. Many months ago, I printed out a ton of pictures of my son because I was going to create a baby album for him. I have a stack of at least 40 pictures from his first month alone, plus baby shower pictures and maternity pictures. I even went so far as to figure out how to layout about 6 pages of these pictures a while back (though do I have any idea what those layouts were at this point? Nope!) but then the pictures went back into the stack. And there they still sit…in a stack…on a shelf. But I had an epiphany today! I was avoiding scrapping those pictures because, aside from being busy, I was wanting to make “the just right” layout with the images including the perfect paper, embellishments, etc. But I realized, its way more important to get the information written down and the pictures in a place they might actually be looked at, then having the perfect layout. 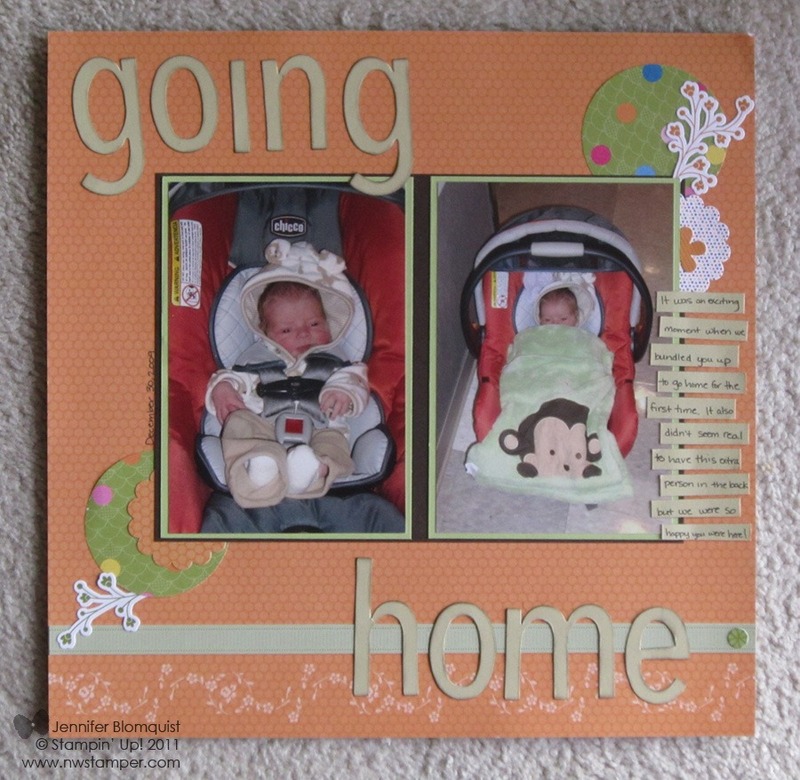 Especially in this world of digital photography, just put some layout together and you can always print the pictures again if you want to make it "perfect” later! So, with that in mind, I put together this layout yesterday afternoon during Nicholas’ nap. I was challenging myself to use the Ice Cream Parlor Designer Paper and Quick Accent die cut stickers in a layout and I actually think they turned out rather well! With the exception of some cardstock and the BigShot Alphabet dies, everything comes from the Ice Cream Parlor Designer Paper and Quick Accents bundle from the Sale-a-bration catalog. Because the quick accents are stickers, it made it really easy to put this page together! There are still a few days left to earn them with your order or enter my color challenge and you’ll have a chance to win some Quick Accents to play with. Now, if only I dare to pull down my wedding pictures from 10 years ago and get started with them too… I guess one step at a time! Only 4 days left of Sale-a-Bration! Did you get your FREE stamps? When my downline, Pam, suggested having a class focused on using the designer fabrics; I thought it was a great idea. She was looking for more ideas on how to use all the cute fabrics and I needed the kick in the pants to start cutting more into my fat quarters. So, I organized a fun afternoon where I shared “no sew” ideas and Bethani, another of my downline, brought an awesome card for everyone to do as well. Since two of the cards used Sale-a-Bration stamp sets, I thought I’d share them first. 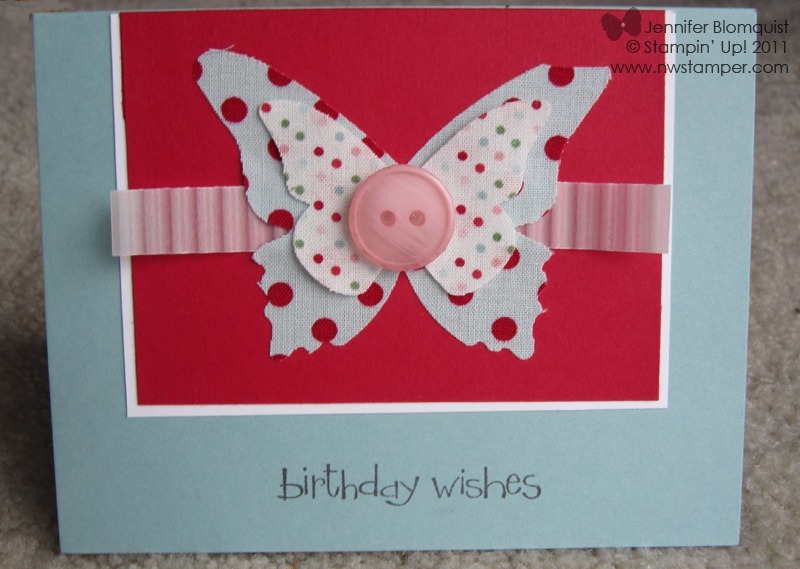 For this card, we use the Sizzix Multi-Purpose adhesive sheets to put adhesive on the back of the blue and red polka dot fabric (we didn’t put any adhesive on the multi-colored polka dot fabric). Then we ran both fabric pieces through the Big Shot using the butterfly Bigz die. Tip: Place the fabric on the adhesive sheet prior to running it through the BigShot. It not only will make it easier for you to have an exact shape match without having to try to line anything up, but the BigShot will provide all the pressure you need to ensure a no-bubble seal between the fabric and adhesive! We adhered the cardstock and then ran a piece of cardstock vellum through a crimper for a fun little touch (ok – and really I somehow completely forgot the vellum at home and so the ladies used whisper white paper and it looked really good too). I adhered the crimped paper in the center only. Then used the big butterfly with the adhesive back as the main adhesive as I layered it over the crimped paper. This is the card that was designed and taught by my downline, Bethani Semple. Isn’t it so fun looking! I think she did an awesome job and though I changed my version up a little by wrapping the ribbon around the Old Olive cardstock, I now think her original version that wrapped the Night of Navy taffeta ribbon around the cardbase was better. Anyway, for this card, we took a strip of the Sweet Stitches Fabric and twisted it (kind of like how you twisted a towel when you were a kid and were going to “snap” someone in the kitchen). So, once you had the twisted strip of fabric, we curled that around a small stick – in this case a paper piercer – to form the flower head. When you were finished coiling, you tucked the end of the ribbon up through the center of your flower. Then, add some hot glue to a punched out circle of cardstock and squish in your flower head. Ta da! Your very own custom accent. Totally fun, huh? In this case we used the ribbon flower as a head for one of our Sweet Summer flowers, this set is also from the Sale-a-Bration catalog. Only 5 days left of Sale-a-Bration! Did you get your FREE stamps? 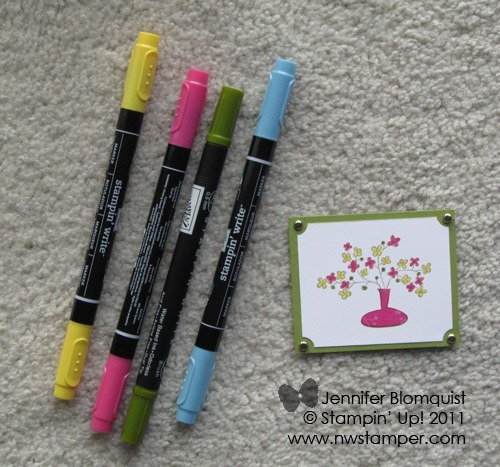 A Spring Color Challenge – Play along and win! 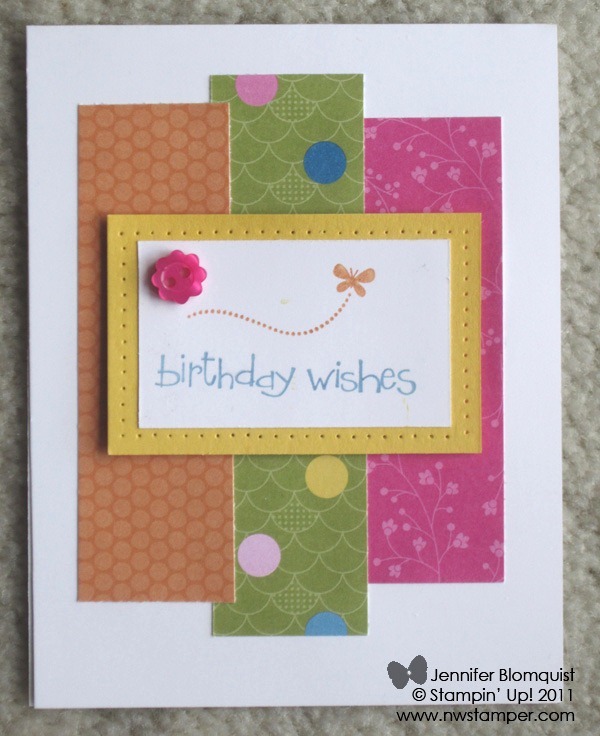 You could make a card, a scrapbook page, a 3D item, or anything you feel inspired to do! My goal is for you to try out a fun new color combination that you might not have tried before. Don’t have one of the exact colors? That’s ok! Use something similar for a similar effect. Now, on to the fun stuff – a giveaway! Wanna win some goodies from me? You can even pick the color of buttons for your kit. So, between the coordinating stickers, ribbon, and the cardstock and papers, you will have lots of options for some fun bright and cheery cards. I’ll post some of the challenge submissions here on my blog as well to help give you some extra ideas along the way too (obviously with full credit to the brilliant creator who made it!). I will be drawing a winner at 10pm PST on 3/31, so make sure you get your entries posted by then! So, until then I hope you enjoy this color challenge – I know I can’t wait to play along myself! Only 6 days left of Sale-a-Bration! Did you get your FREE stamps? One Week Left to get Free Sale-a-Bration Goodies Like These! Oh my goodness, is it seriously almost April already? How did that happen? That also means that there are only a handful of days left in Sale-a-Bration! This is also usually the time that I get wistful that some awesome stamps and accessories are about to be retired and I use the heck out of them to make up for lost time. And so today is no exception! Here are two cards that I made for a card night I’m running today. Both use the Ice Cream Parlor designer paper (that comes with the Quick Accent die cut stickers). 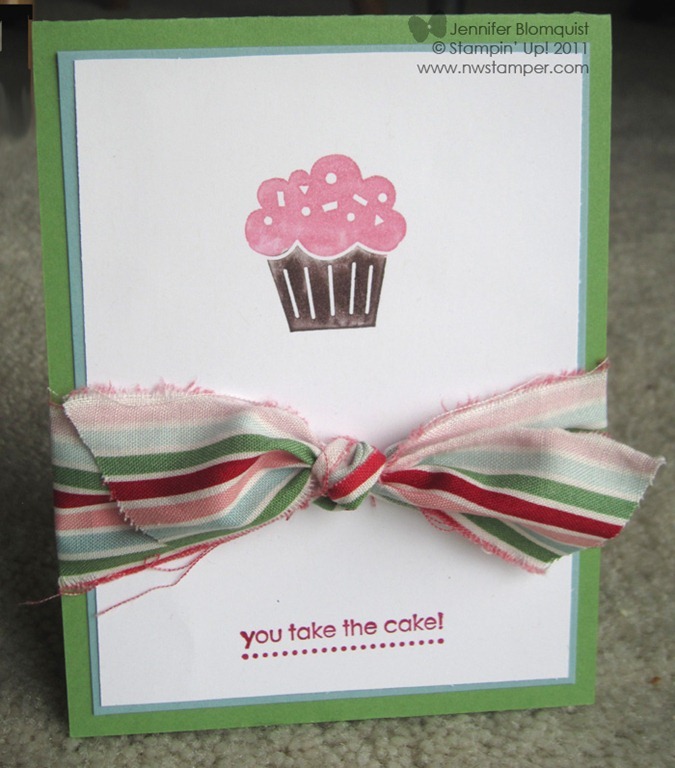 This first card here uses the coordinating Ice Cream Parlor buttons – seriously how stinkin’ cute are they? It is taking all of my willpower not to hoard them! Just breathe and say “they will lead a happier life when they are on a card being given to someone instead of on a shelf in a bag”. 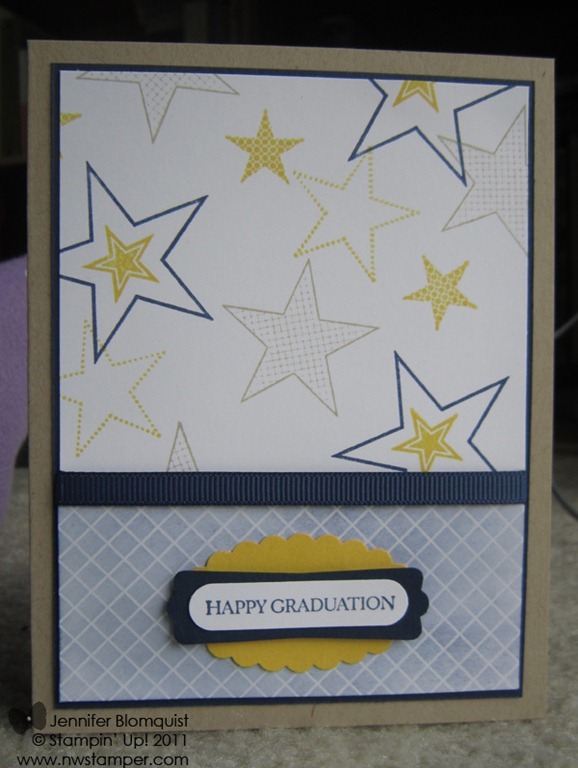 I also used the So Happy For You stamp set…my absolute favorite from Sale-a-Bration this year. I know this set won’t be collecting dust in my house! Finally, though you can’t see it, we’ll be spraying Smooch Spritz in Gold Glow on the Daffodil Delight cardstock for an extra bit of fun shimmery shine. I also decided to go outside of my comfort zone and had NO sentiment on the front of the card. I don’t know why its seems like you must have a sentiment on the front of the card, but I’m trying to convince myself you don’t. I’d love to here what you all think! So, don’t miss out on your chance to get these cutie patootie buttons and ribbon pack, or the designer paper and quick accent pack; either one for FREE with your $50. Or get both with a $100 order. Only 8 days left….and counting!